Three decades ago, the genre of science fiction cinema and literature was marking a transition from the "how the west was won" moving epic western to a more forward looking age of exploration in the "final frontier" of space travel and space colonization. In 1968 when both the movie and book entitled 2001: A Space Odyssey were released, the year 2001 must have seemed ever so far away. To imagine ahead to this turning of the millennia was the make-up of movie spaceship miniatures and high flying dreams. Now that this turn of the century is directly upon us, is it any wonder that science writer and novelist Arthur C. Clarke has recasted his 2001: A Space Odyssey storyline in the year 3001 -- yet another millennium distant? 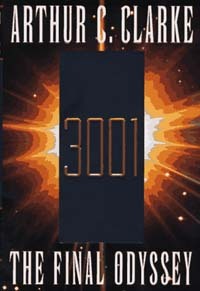 3001: The Final Odyssey is the fourth book in a series that began with a short story entitled "The Sentinel". A cautionary tale of an alien probe keeping watch on the human race, it was later adapted into the movie screenplay entitled 2001: A Space Odyssey , co-authored and realized by film director Stanley Kubrick. In later years, two sequels to the book by the same title would be written by Arthur C. Clarke; all of them haunted by the ominous possibility that we are being watched, and perhaps even judged. In one of the longest story timelines ever created, Arthur C. Clarke's odyssey of man begins ages ago when a dark indestructible monolith suddenly appears on the ancient savanna plains of Africa. Its very presence marks the turning point between man the cowering savage and man the sentient being. For the first time, a bone is used as a tool, and then almost immediately as a weapon. Four million years later, mankind makes a second equally major transition when he escapes the gravity well of earth to enter the Space Age. In the backstory segments of 3001 , man has discovered that he is probably not alone in the universe when a second dark and equally enigmatic monolith sends out a piercing radio signal from its excavation place on the moon. With the human race no longer subject to earth's gravity, something utterly and extraterrestrially foreboding has awakened to take notice. When astronauts Dave Bowman and Frank Poole fail in their interplanetary mission to learn the destination of the extraterrestrial radio signal, the supercomputer HAL 9000 is thought responsible. Afterall, HAL's artificial embodiment of man-made intelligence had been forcibly disabled by Mission Commander Bowman when Executive Officer Poole failed to return from an outer hull maintenance assignment. Almost ten centuries later as the story opens in 3001 's "Chapter 1: Comet Cowboy," a small but intriguing radar anomaly is picked up on the outskirts of the solar system. A lone astronaut is found floating in an orbit heading into deeper space. Despite heart and lungs rendered long ago inactive in the airlessness of outer space, the space-suited man is revived and restored to full health using advanced medical technology -- technology that by today's standards would surely be indistinguishable from magic. This human relic from an earlier era is the sole surviving crew member from the earlier 21st century mission. The epic adventure of another lifetime continues as a third even larger Monolith sits on the newly formed planet Europa. In previous sequels to 2001: A Space Odyssey , the solar system's Jupiter had been converted into a small star by the Monolith. Europa, once a Jupiter-orbiting moon, is now a life-supporting planet. With ten centuries having passed, the human race continues to be given cause to occasionally wonder when, if ever, mankind will reach the epitome of his own existence. Afterall, it is a narrow divide between fire and ice in which the human race must live. Given the renewed and escalating tinkering by the Monolith alien intelligence, but for the intervention of one man, destruction of that precious balance could spell the end of human existence. Dormant for a millennium, the most powerful Monolith of all is again awakening on Europa. The day of judgment may be at hand, and the fate of space-faring man is held in the balance. The intriguing premise of 3001: The Final Odyssey is one that offers the provocative possibility that the greatest threat to human existence was never Mother Earth nor Father Sky. There was always something else lurking in the interstices of our own existence. Offering a startling retrospective of our time and what might lie ahead, our own twentieth century period in earth's history is likened to a period of rebellious adolescence. It is an end of childhood that begins to find fault not in the stars so much as in ourselves. You can also buy this book online right now.